This entry was written by marcusmillichap, posted on August 15, 2010 at 6:18 pm, filed under Research and tagged Capital Gains Tax. Bookmark the permalink. Follow any comments here with the RSS feed for this post. Trackbacks are closed, but you can post a comment. 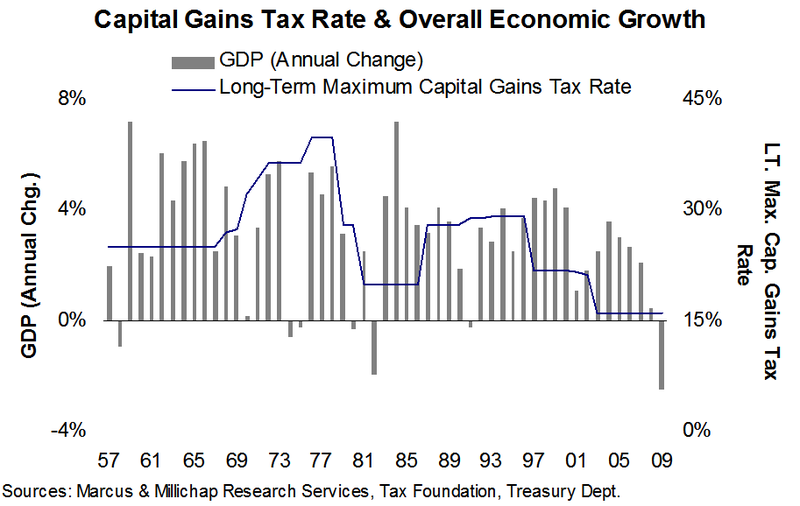 On the surface, the idea that the increase in capital gains tax will spur an increase in sales velocity may seem valid. But if whoever did this research was actually in the trenches for commercial real estate, they would have noticed that this “basic formula research” will not apply here. Specifically, owners with quality assets are not going to put their property on the market to sell at CAP rates that are now 100 to 200 basis points higher than a few years ago. Simple math suggest that an investor with $1 million in capital gains stands to pay an additional $50,000 from the capital gains increase. However, an investor with a property that puts out a $250,000 NOI, which is what you would basically need to have an asset with at least $1 million in equity, stands to gain around $390,000 if that investor waits to sell his asset at a 7.5 CAP instead of at a 8.5 CAP which is what today’s rates are at. And I’m sure as the numbers are thrown around from CAP Rate to CAP rate, that the gain of waiting to sell for improved CAP rates far out weighs any potential extra taxation. Plus, finding a quality up-leg is difficult today, not to mention getting appropriate funding for that up-leg is even more difficult. It’s disappointing to see such a simplistic headline and report on something that is formula based without any true insight as to what is really going on in the market place. As a client of M&M who recently purchased a property in Phoenix, I hope this type of research can provide more detail and that M&M can step out away from what everybody else says and really hit home with the invesotrs that need quality research in these tough and strange times. Thank you. I think the point of the blog is that some investors may not want to take that risk… who knows how much the capital gains tax will increase over the next few years- they have been as high as 40% in the past and based on current gov’t deficits, they could push past 20% in coming years. Incidentally… if the investor is taking his chips off the table and paying out the taxes, an upleg isn’t relevant since they won’t 1031 (hence the tax hit). Valid points, but I think we’re forgetting that commercial as well as residential real estate have generally been long term investments (and require a certain amount of holding power; which should allow you to shirk the short term change in tax codes). Not to mention the fact that the markets, as well as the tax codes run in cycles of 10-20 years. Thus, we need to look at this from a macro perspective. Unfortunately those who are looking to exit the market (in the next few years) are going to be in a difficult position. On the other hand those entering the market (or shift assets via a 1031 exchange) will be reaping the benefits of a slumped market…it a great time to invest; however certainly not an ideal time to divest. This seems like the perfect time to capitalize on the 1031 exchange. Shifting your assets may result in a loss on the sale, however if done properly you should be able to locate a purchase option that will offset your loss, and likely put you ahead of the game. Tax code change or no tax code change; I think it’s time to get creative and look for a way to use this down turned market to our advantage. I haven’t noticed any decrease in the money the commercial renters are asking for. This is in southern NJ. so noww mee also commenting here.